Do you need more space, or are you just looking for something different? Don't struggle to sell your home and buy a new one in this market. Let Wood Craft Creations build-out your current space. Home remodeling and additions add value to your home while you continue to build equity in it. We also offer free estimates. Wood Craft Creations is committed to providing high-quality construction. It is our objective to meet or exceed all of our clients' expectations while guiding them within their budget. 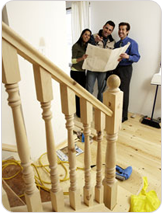 Wood Craft Creations has been serving home remodeling needs for 26 years in the Chicago area. Central to our success is the importance we place on an open line of communication with our clients. We expanded that practice through sub-contractors and trades throughout an ongoing project. Quality and detail are our pride! In 2000, we converted a private residence into a full-service financial and medical office located on Route 59 in Naperville. In 2002, we converted a Boy Scout lodging facility into a 5,500 square foot luxury residence situated on 220 acres in LaSalle, Peru. Contact us for a free estimate on home remodeling services.